On Jan. 31, 2019, meal kit delivery service Blue Apron announced a new meal kit line that will be available on Walmart’s Jet.com, beginning on Feb. 1, 2019. The company hopes the move increases its online and brick-and-mortar store penetration. “The meal kit line bundles sauces, grains, dairy, spices and step-by-step recipes that customers then pair with their choice of a retailer’s produce or protein. Suggested retail is $7.99 for the two-person serving,” CEO Brad Dickerson said during the company’s earnings call on Thursday. 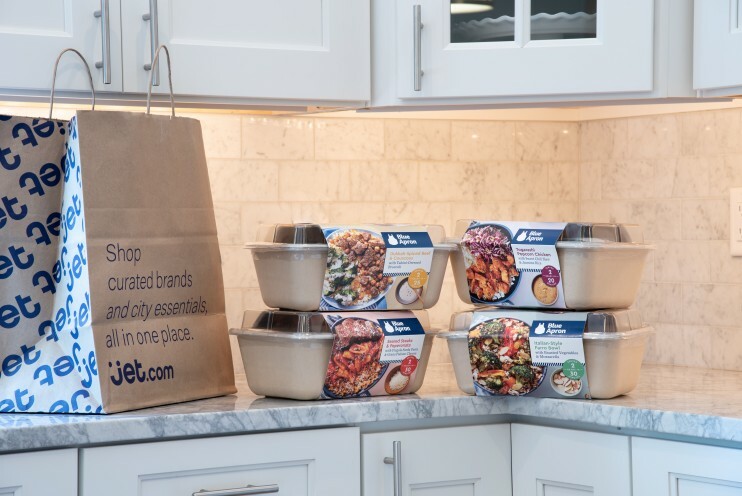 He added that the company was happy with sales of its two-serving meal kits on Jet’s City Grocery platform in the four months since the tie-up began and recently added two additional kits to the lineup. The company’s new product line is the result of its learnings from its retail partnership with Costco stores that began in May 2018. A spokeswoman with Blue Apron told Grocery Divethe “national retail pilot” had ended. In it Q4 earning, Blue Apron reported net losses of $23.7 million compared to $39.1 million during the same period last year — a result that beat analyst expectations. Net revenue was $140.7 million.